Before you can install the ASDK on the host computer, the ASDK host must be prepared for installation. When the development kit host computer has been prepared, it will boot from the CloudBuilder.vhdx virtual machine hard drive to begin ASDK deployment. Before you can install the ASDK on the host computer, the ASDK host computer environment must be prepared. Sign in as a Local Administrator to your development kit host computer. Ensure that the CloudBuilder.vhdx file has been moved to the root of the C:\ drive (C:\CloudBuilder.vhdx). Be sure to download the asdk-installer.ps1 file each time you install the ASDK. Frequent changes are made to this script and the most current version should be used for each ASDK deployment. Older versions of the script might not work with the most current release. 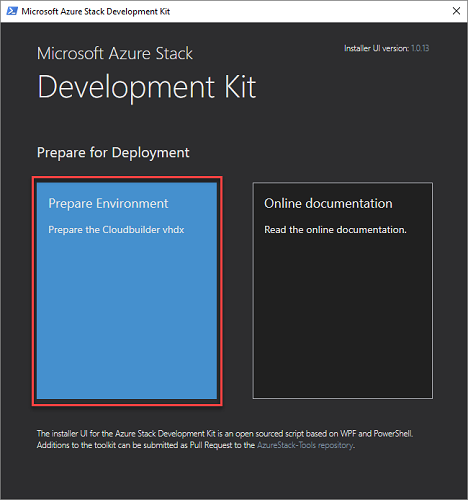 From an elevated PowerShell console, start the C:\AzureStack_Installer\asdk-installer.ps1 script, and then click Prepare Environment. 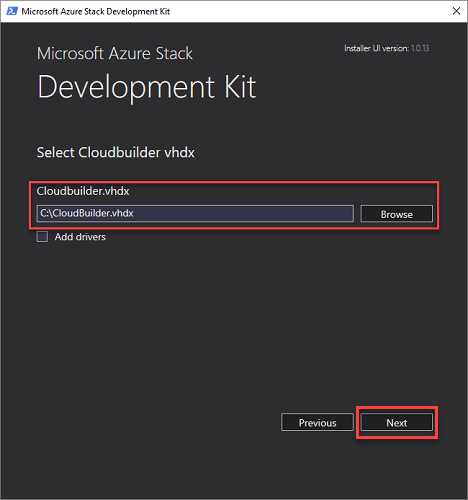 On the Select Cloudbuilder vhdx page of the installer, browse to and select the cloudbuilder.vhdx file that you downloaded and extracted in the previous steps. On this page, you can also, optionally, enable the Add drivers check box if you need to add additional drivers to the development kit host computer. Click Next. 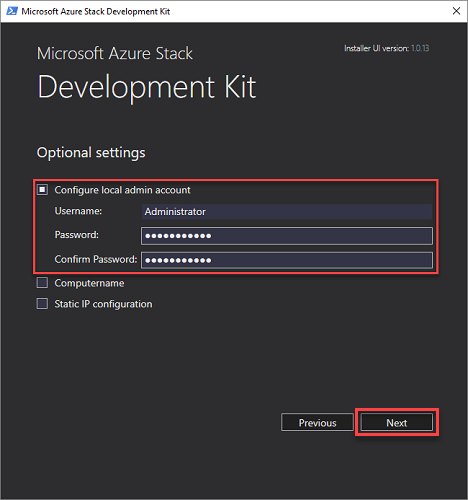 On the Optional settings page, provide the local administrator account information for the development kit host computer and then click Next. If you don't provide the local administrator credentials in this step, you'll need direct or KVM access to the host after the computer restarts as part of setting up the development kit. 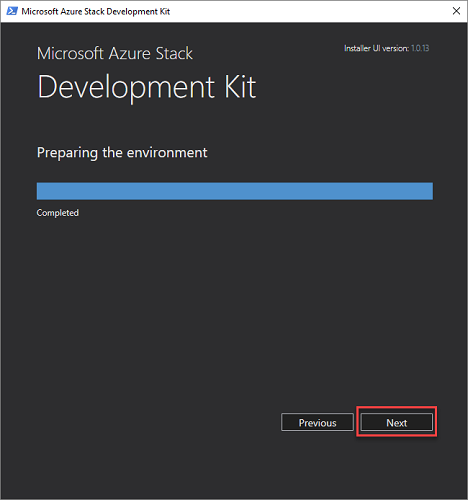 Computername: This option sets the name for the development kit host. The name must comply with FQDN requirements and must be 15 characters or less in length. The default is a random computer name generated by Windows. Select a network adapter. Make sure you can connect to the adapter before you click Next. Make sure that the displayed IP address, Gateway, and DNS values are correct and then click Next. Click Next to start the preparation process. When the preparation indicates Completed, click Next. 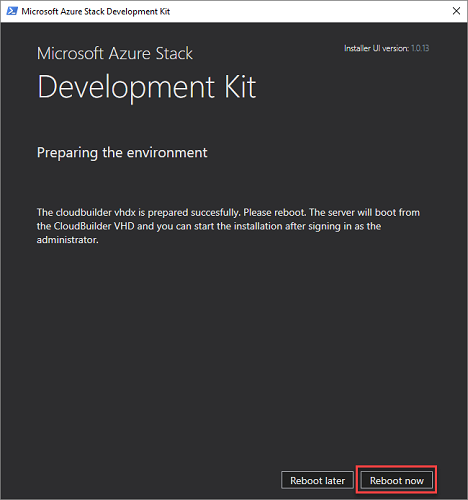 Click Reboot now to boot the development kit host computer into the cloudbuilder.vhdx and continue the deployment process.